I’ve been making these burgers for a few years and we still marvel over how tasty they are. They take a little more planning to make than just plain burgers but the end result is worth it. Don’t overwork your burger meat when adding extra ingredients as it makes them tough. I never add the tomato slices or the lettuce because I love the sweetness of the onions without anything else added to the burger. I don’t remember where I got the recipe from ~ Southern Living, maybe? A nifty tip I learned on the Food Channel ~ to avoid the big bump in homemade burgers when they are cooked, make an indentation in the middle of the burger when shaping them. Don’t poke a hole in it but rather push an indent in it. It really helps to keep them from getting that big bump. Onions: Heat olice oil in a frying pan. Cook onions and sugar in hot oil over low heat 20 to 25 minutes or until onions are caramelized, stirring often. When caramelized, stir in 1/4 cup water, vinegar, and salt. Set aside and keep warm. Burgers: Combine beef, parsley, tomato paste, Worcestershire sauce, salt and pepper. Shape into four patties. Grill over medium hot heat until cooked to your desired degree of doneness. 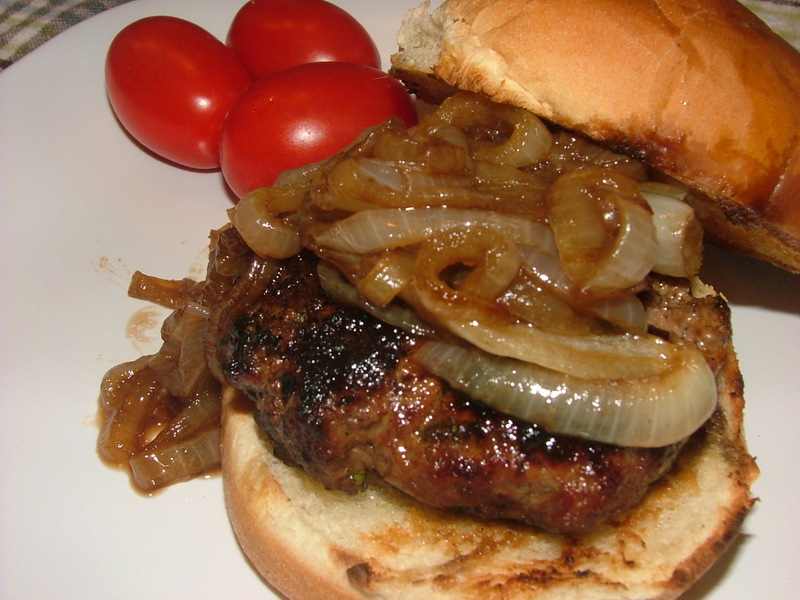 Serve on buns with caramelized onions and, if desired, tomato and lettuce. Boy does that burger look good, and you succeeded in making me hungry. I am Charles Harman and I am an American living in the Philippines. Please visit my website on retiring or visiting the Philippines. Ohhh my goodness! You are making my mouth water with those pictures! I love onions! I’ll definitely have to give that recipe a try! Thanks so much for sharing! Oh those onions look SO good! I’m not fond of burgers, but I think i could handle these with the delicious onions on top! Hey Nancy, I love onions as well and your pics look great. Come by if you have a chance and take a look at my blog and the burgers I have posted. Would love to get your thoughts. GREAT blog! Glad I found you…will be checking back often!! I love caramelized onions on anything!